mentioned below are his teammates, they're also his competition on the racetrack every weekend. Rick Hendrick is one of the most successful car owners in the history of motorsports. His teams have captured eight Cup titles, two Truck titles, and a Busch championship. He was diagnosed in November 1996 with a form of leukemia. After an arduous struggle, he battled the disease into remission just three years later. His race teams have helped raise awareness about leukemia and the need for bone marrow donors. Hendrick is the President and CEO of Hendrick Automotive Group, one of the worlds largest automotive dealership operations with numerous franchises in locations that range from North Carolina to California and annual revenues of more than $2 billion. The Hendrick Automotive Group is the number one retailer in terms of new car sales and dollar volume in the country, and also holds the number one position in used car sales and dollar volume. Hendrick Motorsports, based in Charlotte, North Carolina, fields multiple teams in NASCAR, including the 1995, 1997, 1998, and 2001 championship team driven by Jeff Gordon. He also fields the Farmer's/Quaker State team with driver Kasey Kahne, the AMP Energy/National Guard team with driver Dale Earnhardt Jr, and the 2006, 2007, 2008, 2009, 2010 Lowes championship team with driver Jimmie Johnson. Rick Hendrick redefined NASCAR racing by making multi-car teams work. Some of the sport's great names have driven for him since he began his investment in NASCAR in 1984. Geoff Bodine, Tim Richmond, and Darrell Waltrip are a few of the well known names to drive for Hendrick. When others told him that multi-car teams couldn't work, he didn't retreat. 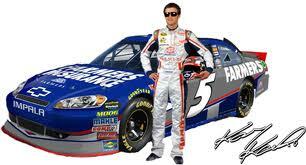 He stay focused on his goals and dreams and has set the standard for multi-car teams in NASCAR. Copyright ©2012 Jeff Gordon Online.